But wait, in French underwear would be slips. I guess that didn't have the same catchy ring to it. And this is a French chain based in Clichy, northwest of Paris. What if they expanded to English speaking markets and people just read it as "slips?" Like short slips or long slips for those really long skirts? And when they explained the name to their English speaking counterparts, they'd pronounce it like a French person, right? So it would sound like "sleeps." Okay, so maybe Undiz is better. 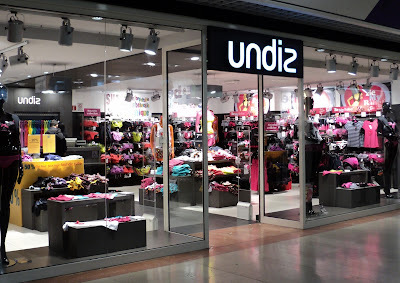 Because they do sell a lot of undies. And I didn't see any slips.